I am building a sand tray bridge for sand tray therapy class. 2nd photo of building a bridge in sand tray therapy class. 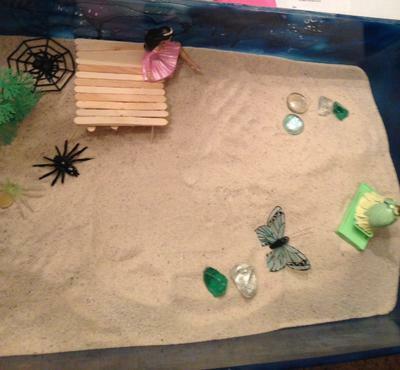 I was really frustrated with creating my bridge for this sand tray therapytray. Even though it still didn't turn out how I wanted it to, I was pleased with my tray overall. My goal was to create of picturesque scene of progression and transformation. On one side of the tray, it represents my past. This is where I placed the female miniature in the pink dress sitting on the bridge. Also, there are spiders around her. That represents any violent or negative people or relationships that I had or have with others. The one tree represents positive relationships I have established thus far. On the other side of the tray is where the miniature looks towards heading. On this side, there are beautiful gems, butterflies, and a pretty princess gazing out from the top of a platform. Both miniatures appear to be looking at each other, one looking at where she's come from and the other looking at what she hopes to achieve. The bridge for me represents the change that is going to occur in my life. I believe that I will come across several bridges in my life because change is inevitable. Now, even looking back on making my bridge for this project, it even more reiterates how we have to adapt to change and be able to deal with what life gives us.